What a winter we just had! We are so glad it has warmed up and that we can finally be outside again! OUTSaskatoon has been hard at work to bring you a shiny and exciting new way to get you the latest of what is happening at OUTSaskatoon and in our amazing Queer community! Hope you like it! Life is truly a series of surprises. We thought we did an amazing job at last year’s AIDS Walk, and this year, our darling community blew last year’s numbers out of the water as we raised more than $56,000 for OUT and AIDS Saskatoon. Just incredible. We are putting that money directly into our sexual health programs, including to support a brand new youth testing clinic on rotating Wednesday nights and to support our 3rd annual Two Spirit Feast and Round Dance on December 1st to commemorate the beginning of AIDS Awareness Week. We also have our second GLITTER Gala on the way on October 21st at the Top of the Inn at the Sheraton Cavalier. As I type this letter, we are already 90% sold out, so if you are quick on the draw you can go to outsaskatoon.ca/glitter_2017 to snap up some of the few remaining tickets. We anticipate another magical night as we enjoy lively entertainment, warm conversation, and hear from many of our community members. Of course, the best part of the night will again be the dance party that follows, so bring your dancing shoes! Also, don’t forget that this Saturday is our Holiday Supper, where you can share in a delicious Thanksgiving feast, and make a few new friends. Now, speaking of friends, I must become a bit more somber for a moment. As many of you know, we recently lost a bright light in our community. Mark Reis passed away in Regina on September 15th. For years, Mark has been a dedicated volunteer at OUTSaskatoon along with many other organizations. His heart was completely in community work, his hands could build, cook, and craft anything we could dream up, and his hugs were the kind of medicine that healed even the darkest days. We will miss you Mark. AIDS Walk 2017 is right around the corner! Make sure to check out www.scotiabankaidswalk.ca/saskatoon to donate now to team OUTSaskatoon or register you and your team today! The upcoming months will celebrate PRIDE in Saskatoon, we will also remember the past, present, and future in our communities. 2017 marks 25 years of OUTSaskatoon and Saskatoon Pride Festival. This last month has included such a lovely mix of nostalgia, celebration, and anticipation as we commemorated 25 years of Gay and Lesbian Health Services, The Avenue Community Centre, and OUTSaskatoon! Our very own Amanda Guthrie was interviewed on gender inclusive washrooms and the very importance they hold. Great job Amanda! Happy Friday! It's a beautiful day here in Saskatoon and the crew at OUT are busy getting geared up for the Pride Festival in this fine city, which kicks off on June 3rd. I've highlighted a few of the fantastic events taking place for Pride below, but make sure you check out the full calendar here. Queer As Film Series - OUTSaskatoon, Saskatoon Pride Festival, and Saskatoon Public Library are very excited to bring back the Queer As Film Series taking place on Wednesdays from 7-9PM. The next screening is of This Is Gay Propaganda on May 25th. Check out the library website for upcoming events. Out On The Green - Saturday, June 4 is the annual tournament at MoonLake Golf Course – Texas Scramble. Shotgun start at 5:00pm! Tickets are still available at OUTSaskatoon's website. 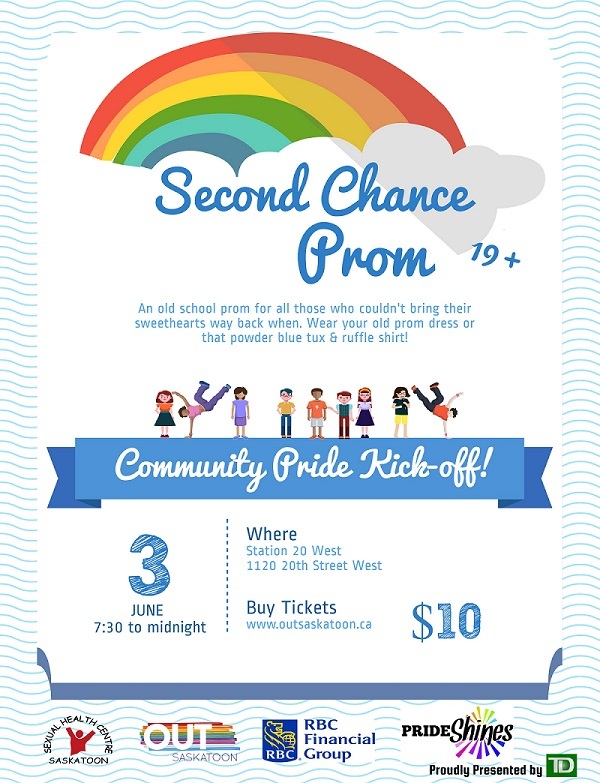 Second Chance Prom - OUTSaskatoon and the Sexual Health Centre are planning an old school prom for all those who couldn't bring their sweethearts way back when! See poster for details. Tickets available at OUTSaskatoon's website. Welcome to the Gaybourhood - Mix and mingle with absolutely fabulous friends and neighbours at OUTSaskatoon’s annual street party on 21st. This FREE, family-friendly BBQ also features a Street Sale with one of a kind finds at rock bottom prices! That's about all we have for now. Thanks for reading, we hope there is something here you might be interested in. The OUTBurst is our bi-monthly online newsletter to keep you in the know regarding events and programming at OUTSaskatoon. Watch this space for future updates or send an email to Sarah at hello@outsaskatoon.ca to have the OUTBurst emailed to you twice a month!